The school hopes to reopen on Monday at 10a.m. pending further directives from the Department of Education & Skills. Many thanks for the wonderful snow pictures! The children certainly enjoyed the snow! 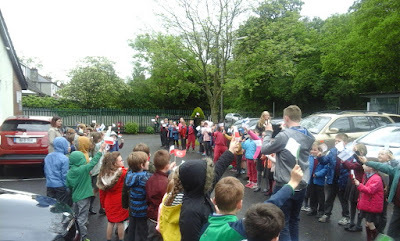 They later joined Ms. Mathew's and Mr. Brennan's classes for a maths hunt outside. The children were challenged to find 15 QR codes hidden outside around the school and use their maths skills to answer the questions and complete the tasks. Some members of the Parent's Association were also on hand to lend a helping hand. Mrs. Dunne, Mrs. Averill and Mrs. Kelly and our guests went to visit Malahide Community School where they were given a guided tour of the school. Some of the teachers kindly met with our guests to demonstrate the software they use at school and how they use iPads and tablets. Our guests then travelled to Dublin for some sight seeing and shopping. We are very excited to have been accepted into an Erasmus+ project. We are working with schools in Spain, Poland, Turkey, and Finland to exchange best teaching practice on using iPads in education. As part of the project, teachers visit partner schools to observe examples of best teaching in action. We can really see a difference to the extension now! A group of teachers (looking good in their hard hats!) visited the site recently to decide on first fixings for electrical appliances. The plasterers are busy plastering the walls of the main corridor and the classroom furniture has been agreed. Here's a few new pics to keep you updated on progress to date. I would like to thank you all for your continued support by being patient at drop off and collection times, putting the appropriate clothing and footwear on the children (particularly for the mucky areas) and for all the well wishes during this mad time! I will continue to keep you all posted and enjoy the pictures above. Many thanks to Garda Enda Dwyer and Comadt. Jarlath Heneghan for flying and landing the Garda Helicopter in the grounds of Malahide Castle on Monday 25th May for the 1st Class children. The children had an amazing time exploring and asking questions about the helicopter and Garda cars. We would particularly like to thank Enda, Jarlath and the many members of our local Gardaí who all gave up their free time to answer the children’s questions about their work. They all ensured the children had a wonderful and memorable experience! Thanks everyone! It was really appreciated!